First Facebook came out with it, then Google followed and now Twitter has come out with their own “What was Hot in 2013” list for India. 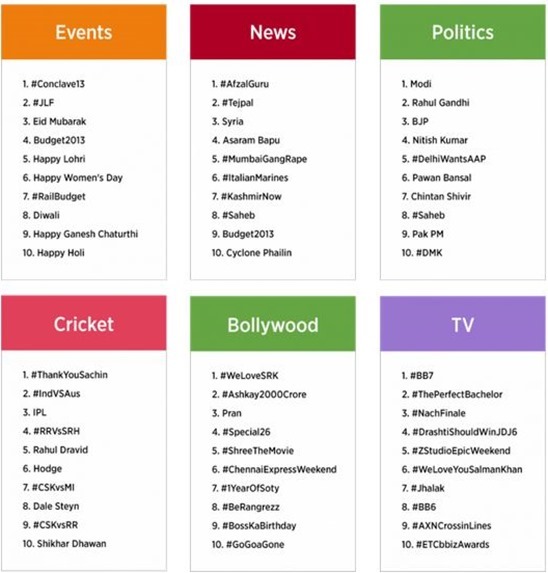 Twitter released data on top trending topics, people and events by mapping conversations of more than 20 mn Indian users. In 2013, people in India used Twitter to discuss sports, politics, television and news events that were both local and global. The country loved tweeting about cricket this year, with some of the top trends including #ThankYouSachin, #IndvsAus and #IPL. It also provided a platform to share voices for TV shows – programmes such as #BB7, #ThePerfectBachelor and #KoffeeWithKaran ranked highly. And if you thought people were not concerned about real news, Twitter proved it is also the place people turned to discuss breaking news, from international events in Syria and Egypt, to the devastating Uttarakhand Floods (specially the Army relief) and Cyclone Phailin (which had stuck Orissa). Trending topics help Twitter users discover the hottest emerging topics people are talking about as they break, rather than the total volume of conversation about a topic, making the platform a great place to keep current with the latest events and news. Twitterati: Prominent voices from across the world of entertainment, sports and government joined Twitter in 2013, including Anil Kapoor (@AnilKapoor), Sridevi (@SrideviBKapoor), Saina Nehwal (@NSaina), Sourav Ganguly (@SouravGanguly) and the Indian Army (@adgpi). Top Events: The India Today Conclave ’13 in March, the Jaipur Literature Festival in January, Eid, the supposedly last Congress Budget and Lohri amongst others were the top events Indians talked on Twitter. Top News: Controversies rule the roost here. Afzal Guru, Tarun Tejpal, the unrest in Syria, Asaram Babu and the infamous Mumbai Gangrape amongst others were the hot new incidents tweeted the most. Top Politics: No surprises here as Narendra Modi, Rahul Gandhi, BJP, Nitish Kumar and the recently concluded Delhi elections with AAP being the real winner (#DelhiWantsAAP) the most talked about political news. Cricket: Sachin’s last Test had prompted @ESPNcricinfo to come up with #ThankYouSachin, tweeted by tens of thousands of people by which the legend himself was moved. His reply eventually went on to become the most retweeted tweet in India this year with over 17,000 RTs. India vs Australia (hosted in Oct-Nov), IPL and Rahul Dravid were also talked about a lot. Bollywood: What Sachin is to cricket, SRK is to Bollywood. Apart from him, Akshay Kumar’s total movies crossing 2000 cr, Pran (who died in July) and a couple of good movies were the fodder for tweets. TV: Bigg Boss 7, full of spice, ruled the roost here. The Perfect Bachelor (Mallika Sherawat had also called Karan Johar a perfect bachelor), Nach Baliye finale and Jhalak Dikhhla Jaa were among the most discussed and commented in real time. This could well mean that Twitter could be contemplating making its TV tools available to Indian audiences and content providers. Going by these trends, do you think Facebook is losing its steam to Twitter in India? Do you think anything special might happen in the days remaining to change these trends?